So it was no surprise to me that my friend’s mom had a psychic over at the house. The psychic was Russian and was able to communicate with my friend’s mom in broken Polish, while my friend’s mom responded in broken Russian (while both Polish and Russian are Slavic languages, contrary to popular belief, they are not mutually intelligible). The language barrier was overlooked, as there was an understanding that Russian psychics were the best kind. At my friend’s mom’s insistence, the psychic stood over me and began to hum, almost vibrating… After a few minutes, she told me that I had the early signs of a thyroid problem and a heart problem (I had not been diagnosed with either at the time). There are two types of deficiencies that can occur with respect to nutrients. There are overt deficiencies, which can lead to low serum calcium or potassium levels, due to a disturbed balance of minerals in the body. This is a serious condition that can present with numbness, muscle contractions/cramps, seizures, personality changes, abnormal heart rhythm and other types of serious reaction. This is relatively rare, as, in times of low intake, the kidneys kick in to prevent the excretion of magnesium, holding onto it to prevent this. This past winter, I had the first-hand experience with my bout of magnesium deficiency. After a period of stress – I relapse on caffeine when I’m stressed – and a few rounds of chelation (I thought that it would be a good idea for preparing my body for pregnancy – more about why this wasn’t the best idea some other time…), my husband and I decided to take a vacation in the Dominican Republic. Roy and Helga Moncayo, two Austrian researchers, have been working with people with autoimmune thyroid disease since 2007. In their initial interventions, they noticed that thyroid patients had low selenium and began to supplement them that way. Selenium did not lead to lasting results. 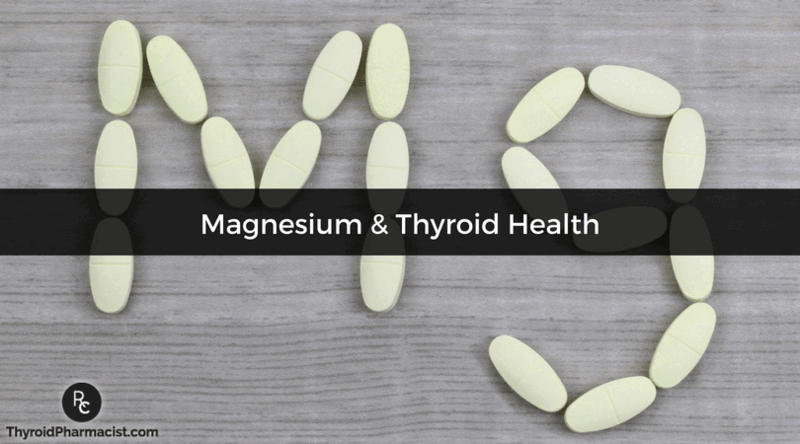 They continued to dig deeper and found that Magnesium deficiency correlated to many thyroid symptoms. Earlier in this article, I alluded to the fact that magnesium is used as a laxative. This is only true for certain salts of magnesium. Specifically, for people with Hashimoto’s and constipation, I recommend Magnesium Citrate. For period cramps: Prevention is key for period cramps, so if you tend towards period cramps, start magnesium ASAP. You can do either magnesium citrate or magnesium glycinate. This should help your cramps right away! If you are having acute cramps, you can also take magnesium as needed, 1-4 per day – this will relieve your pain as quickly as Ibuprofen, without the side effects… If you find that your periods are still painful, that may be a sign that you will need more time on magnesium to replete your stores and that you should work on your adrenals, which can lead to menstrual issues when impaired.You can combine magnesium with Ibuprofen for period cramps in that case. Your ultimate goal, of course, is to get off the Ibuprofen and save it for emergencies only. 🙂 I’ve also found hot water bottles or socks filled with rice, microwaved for 2 minutes and placed over the stomach, to be helpful in acute situations. If you are a techy-nerdy-biohacker like me, you can also pre-order a new gadget called “Livia” for period cramps! It is a device worn under your clothes and uses low power frequencies on your tummy to reduce cramping. For body cramps: Increasing your magnesium stores will prevent cramps, so if you have intermittent cramps now, you should start magnesium preventatively. You can do either magnesium citrate or magnesium glycinate. If you are having acute cramps, you can also take magnesium as needed, 1-4 per day (magnesium glycinate is less likely to cause diarrhea, as well as soak in Epsom salt baths – they are so soothing and a wonderful tool for your self-care routine 🙂 ).If you find that you are still cramping, that may be a sign that you will need more time on magnesium to replete your stores, or that you have other nutrient deficiencies or food sensitivities. You can combine magnesium with pain medications as you work your way off them. In most cases, taking magnesium with pain medications at the same time should be fine, though I’d recommend checking with your pharmacist first, as magnesium can prevent the absorption of some medications. I’d like to share some additional resources for you to help you overcome your health challenges. I know that some people prefer book learning, while others enjoy courses, so I include both options here for you. I spent over $100,000 to get my PharmD degree. I learned so much and now have wonderful credentials from my formal education, but I’ve also learned so much since then that is NOT taught at universities! I feel so blessed to be a part of the digital age where we can learn from the experience of others on how to recover our health for a fraction of the cost of a basic class at a community college! My book, Hashimoto’s the Root Cause is a guide you can use. My Hashimoto’s Self-Management Program has assessments for 16 different root causes, (like the one for magnesium deficiency above), to help you determine your root cause triggers and learn about the most helpful interventions for the many symptoms related to autoimmune thyroid disease, based on your unique symptoms and history. The Period Repair Manual: If you’re looking for a book on getting your period on track, this book is a wonderful tool. I don’t know the author, but hope I can meet her one day to shake her hand and thank her for her work! No Grain No Pain: My friend Dr. Peter Osborne’s brilliant book on pain. The Food Anxiety Solution: My good friend and phenomenal nutritionist Trudy Scott wrote this excellent book. Headache Free: My fellow pharmacist and friend Suzy Cohen wrote this groundbreaking book. Have you tried magnesium? How has it helped? What are some additional things you’ve tried for the above-listed conditions? Lundberg, MD, G. Magnesium Deficiency: The Real Emperor of All Maladies?. Medscape. 2015. Available at: http://www.medscape.com/viewarticle/844214. Abbas A, Sakr H. Effect of magnesium sulfate and thyroxine on inflammatory markers in a rat model of hypothyroidism. Can J Physiol Pharmacol. 2016;94(4):426-32. doi:10.1139/cjpp-2015-0247. Moncayo R, Moncayo H. The WOMED model of benign thyroid disease: Acquired magnesium deficiency due to physical and psychological stressors relates to dysfunction of oxidative phosphorylation. BBA Clin. 2014;12(3):44-64. doi:10.1016/j.bbacli.2014.11.002. Cinar V. The effects of magnesium supplementation on thyroid hormones of sedentars and Tae-Kwon-Do sportsperson at resting and exhaustion. Neuro Endocrinol Lett. 2007;28(5):708-12. Available at: http://www.ncbi.nlm.nih.gov/pubmed/17984925. Baydas B, Karagos S, Meral I. Effects of oral zinc and magnesium supplementation on serum thyroid hormone and lipid levels in experimentally induced diabetic rats. Biol Trace Elem Res. 2002;88(3):247-53. Available at: http://www.ncbi.nlm.nih.gov/pubmed/12350134. Kawicka A, Regulska-Ilow B, Regulska-Ilow B. Metabolic disorders and nutritional status in autoimmune thyroid diseases. Postepy Hig Med Dosw (Online). 2015;69(2):80-90. doi:10.5604/17322693.1136383. Magnesium: Fact Sheet for Professionals. National Institutes of Health: Office of Dietary Supplements. 2016. Available at: https://ods.od.nih.gov/factsheets/Magnesium-HealthProfessional/. Calcium And Magnesium In Drinking Water: Public Health Significance. Geneva: World Health Organization Press; 2009. Available at: http://apps.who.int/iris/bitstream/10665/43836/1/9789241563550_eng.pdf. Soma M. Effects of low magnesium diet on the vascular prostaglandin and fatty acid metabolism in rats. Prostaglandins. 1988;36(4):431-41. Available at: http://www.ncbi.nlm.nih.gov/pubmed/3238000. Moncayo R, Moncayo H. Exploring the aspect of psychosomatics in hypothyroidism: The WOMED model of body–mind interactions based on musculoskeletal changes, psychological stressors, and low levels of magnesium. Woman – Psychosomatic Gynaecology and Obstetrics. 2014;1:1-11. doi:10.1016/j.woman.2014.02.001. Moncayo R, Moncayo H. The WOMED model of benign thyroid disease: Acquired magnesium deficiency due to physical and psychological stressors relates to dysfunction of oxidative phosphorylation. BBA Clin. 2015;3:44-64. doi:10.1016/j.bbacli.2014.11.002. Moncayo R, Moncayo H. Proof of concept of the WOMED model of benign thyroid disease: Restitution of thyroid morphology after correction of physical and psychological stressors and magnesium supplementation. BBA Clin. 2015;3:113-122. doi:10.1016/j.bbacli.2014.12.005. Paula- Thank you so much for your support. I’m looking forward to hearing your progress on this page. Make sure to take the book slow, take notes, highlight, and establish a baseline when making changes. Thyroid tissue can regenerate, but the rate at which it does is not always predictable. Thus, some are able to stop the autoimmune attack on their thyroid and regain normal thyroid function. Others can reduce the dose of medications, and others will need to stay on the medications indefinitely. I’m currently working on some protocols to help with tissue regeneration. Hi! Just found your site. I have suspected thyroid issues and just got my bloodwork and is trying to understand it. I helps! I try to learn how to read my bloodwork. ie can I trust the references the doctors use. I tested magnesium and I’m not deficient, it was actually pretty high in the chart. 0.9 (ref 0,70-0,95 mmol/L). Do I need to supplement anyway? Helene – thank you for following this page. Why magnesium citrate or glycinate and magnesium hydroxide? These are the ingredients on the mag supplement I take. Could this be why. O thing I do works for me? Maureen – there are about 20 different types of magnesium and the Magnesium glycinate and Magnesium citrate are the ones that I’ve seen people have the most success with. Hi! I am happy that I found your website. Recently I made TSH tests and the value is <0005 from 0.27-4.2 that is the range. what food supplements should I take except Unimazole 5 mg 3 times per day? Should i take magnezium, vitamin b complex, vitamin c? I would appreciate your answer. Thank you! Ledia – thank you for following this page. I have Hashimoto’s and am currently taking NatureThroid 32.5MG/day, half upon waking (between 7-7:30am) and the other half approximately 4 hrs later. I take Magnesium glycinate, 120mg and calcium, 250mg X 3/day with each meal. I had read somewhere that I should separate the calcium from the thyroid med by at least 2 hrs. Now I read that you recommend 4 hrs between med and magnesium. How can I do this if I take magnesium 3x/day? I have broken down the magnesium dose this because I have had trouble in the past with diarrhea if I take a larger dose all at once. Tina – thank you for following this page. I’m hesitant to say what you should do … based on liability. If something were to happen to you I could lose my license. What are your thoughts on topical magnesium oil? I have heard that it is a more effective way to absorb magnesium than supplements. Just ordered your book and look forward to reading it. Rebecca – thank you for following this page. There are about 20 different types of magnesium and the Magnesium glycinate and Magnesium citrate are the ones that I’ve seen people have the most success with. Dr. Wentz, I bought the book and the audiobook. Thank you for all the info you provide. It has helped me understand my hypothyroid. My questions; is decaffeniated coffee ok or should I eliminate that too with my caffeinated coffee, teas and beverages? 2) which magnesium helps with anxiety, I believe I read magnesium glycinate in your book. Thank you for caring about your thyroid work/research. Ketta – thank you for following this page. For questions pertaining to the protocols please contact my team at info@thyroidpharmacist.com and they will be happy to help you. Jamie – thank you for following this page. Here is an article you might find helpful. Leonie – thank you for following this page. Here is another article which you may find interesting. My question is, I take liquid magnesium at bedtime as well as applying topical magnesium spray on my feet. Then in the morning after a shower I apply more topical magnesium spray this ususlly within 1 to 1 1/2 hours after taking my thyroxine. Susan – thank you for following this page. There are about 20 different types of magnesium, Magnesium Glycinate and Magnesium citrate are the ones that I’ve seen people have the most success. Here is a link to the one I recommend. Maybe it was all the delicious pierogis I ate growing up that contributed to my Hashimoto’s (a little humor here). My Babci made the best ones. You don’t mention anything about dosage. How much magnesium should I be taking? I see that the magnesium citrate you recommend is only 80 mg. So when you say to take 1-4 a day you mean 80-320 mg, right? The magnesium tablets that I take are 250 mg and I take 2 every night to help me sleep, but they don’t seem to have any effect. Two nights ago I took 3 (i.e., 750 mg) and slept better than usual. Is it safe to take so much? Hi there! I keep coming back to this post. I really feel it’s far and beyond the most helpful hypothyroidism article I’ve read. My sister (45) had surgery to fix her mitral valve prolapse after years of monitoring. It first showed up when she was 27. I was diagnosed with Hashimoto’s when I was 25 and am now 43 and got so little help from Synthroid. (I mean why wouldn’t doctors just at least prescribe Armour instead?) My mom has an insane time with magnesium deficiency and heart disease is the main issue on both sides of my family. Your research and path just totally resonate. So here’s my question – finally!! 😉 I have been taking mag glycinate, but read that citrate has more elemental magnesium in it and that is what Drs. Moncayo suggested. Do you think using a mag with higher elemental mag would give better results like they found (I know it took months) than a form of mag with lower levels? Also, have been totally fascinated with sulfur and it’s impact on a myriad of things, but for me and my daughter, it’s impact on congestion. What are you thoughts on the value of sulfur and the lack thereof in our diets? Thanks!!!!! Isabel – thank you for reaching out. I wish I could give you more direct advice but, each person will react differently. I would advise you to ask your trusted clinician who’s care you are under. I am not able to respond directly to these types of questions here. I also don’t recommend starting multiple supplements all at once. I recommend starting one at a time, and then adding another a week or so later once it has been confirmed that the first supplement is not causing any harm. Hi! What great information! I have Hashimoto’s, but recently have had symptoms of being overmedicated (nearly every symptom of hyperthyroidism). I am hoping it is in remission or improving, and I recently lowered my dosage of Levothyroxine. Based on your suggestions (as well as Dr. Axe), I am planning to start taking magnesium, selenium, and COQ10. Regarding magnesium – I am both prone to diarrhea and prone to anxiety. This is making it hard for me to decide between the two types you mentioned. Which is a more common side effect, or which should be the greater concern? Thanks so much! I am looking forward to reading more of your articles. Magnesium Threonate was mentioned somewhere as an alternative to the citrate (I don’t have constipation) and glyconate (Preferring to avoid anxiety)… is Threonate a good option? I would like to try a Magnesium supplement but I am already taking T3 and Tirosint for Thyroidectomy induced hypothyroidism (have Graves and Hashi) and I am also experiencing low cortisol currently. Which Magnesium would be a good version to try? Love your books and site. Health & less stress to all!! When I started mag supplementation, I first tried mag citrate. It triggered terrible headaches. After some internet research, I found that this is not uncommon with the citrate form. So I now take mag glycinate and have none of negative side effects. Thought I’d throw this out there for others who may be having the same issue. Thanks for your excellent article. I’ve bookmarked it for future reference. Have you heard anything about magnesium citrate causing mania? Bob – Thanks for your question! I’ll add this to my list of future research possibilities. I would love to hear more about your experiences here on this page! I’m not sure if you still check this, but I’ll give it a shot! My doctor recommended I start taking magnesium to help with some Lyme induced muscle spasms. I’m also on a lengthy and aggressive antibiotic protocol, which has warranted that I also take 100 billion CFU of probiotics. I know that magnesium should be separated from both thyroid medications (of which I’m on two) and antibiotics (also two); should I also try to space magnesium out from my probiotics, or can I take them together? Joyce – thank you for reaching out. I regret that I do not have the time to evaluate every supplement on the market. As a pharmacist, I can tell you that many supplements are ineffective, and some are even downright unsafe. The truth is that most supplement companies do not undergo the same scrutiny and testing that pharmaceutical products do. This is because many of the tests required of pharmaceutical companies are voluntary for supplement companies and most companies do not take the extra steps to test their products to ensure safety and purity. I recommend that you do your research and check with your doctor who familiar with your health history. Hello! My dr is having me on magnesium 100% chelated. It costs much more than regular magnesium glycinate. Do you think one is preferred over the other? I am so happy I came across your website – so many things make sense now! Tammy – thank you for reaching out and sharing. There are about 20 different types of magnesium. Magnesium glycinate and Magnesium citrate are the ones that I’ve seen people have the most success with. I recommend that you discuss the different forms of Magnesium with your practitioner. Hello Izabella, thanks for so valuable information that you give! Do you recomend magnesium chloride? (I do have constipation). I’ve alredy prepared it and I was going to take about 75ml, but I didn’t find information here about this form of magnesium. Thank you!